And I found this one. It's about 8 years old, taken with my first serious digital camera, a Canon Powershot G2. Great Camera. I love this photo (don't know if you do) it just says something to me (and whatever it says to you is for you, if it says anything at all). And I couldn't post old photos without my favorite. Couldn't give you a good reason why. At least nothing other than they're neat. Might have something to do with growing up in LA and not really having any trains though. I guess LA does actually have Union Station, but...not really the same kinda thing. is a very beautiful city. That's not entirely a smile of excitement. It's reminiscent of this. And when I asked her to get the bird closer to her head for a nice photo, this is what I got. But she's trooper and managed to touch the shark. And it was NOT a small shark. I did hear her mutter something about "rather touch the shark than feed the bird again..."
Like the giant graters (check out the scowl on the guy behind her). okay maybe not for the waxworks...But definitely for the burgers! But not for whatever it is she's eating this time. But look! My niece even loves Japanese maps! is awesome. Now I'm a big fan of San Diego Zoo. I mean it's really pretty amazing. But I prefer The Wild Animal Park. But only if you pay the extra for the special truck tours that go inside the enclosure. That's spectacular. 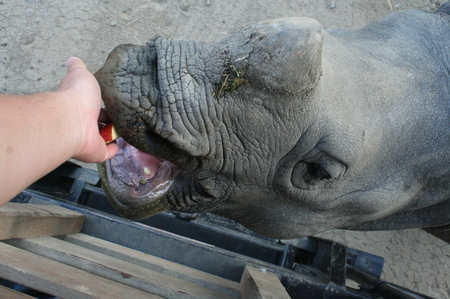 You get to feed giraffes and rhinos for goodness sake. I mean that's cool. But check this out. We got to feed MANATEES!!! Dude the Singapore Zoo rocks. The had a big python too. At least I think it was a python, it may be an anaconda. But either way it was huge. At its thickest it was bigger than my thigh, and I'm no flyweight. And you can get really up close and personal with the fruit bats. They're actually kind of cute. 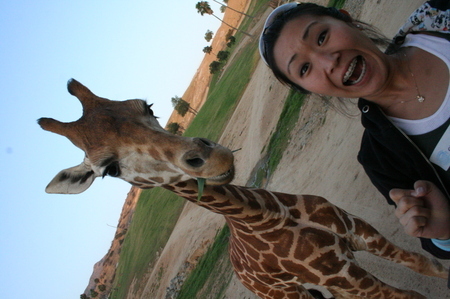 and you get to feed Giraffe's too!